"Anyone birding the DeKorte area this weekend, please check those Doves you see around the park. "Wednesday afternoon I saw a probable Eurasian Collared Dove sitting in my driveway. I'm only 2 houses from Schuyler Ave., I saw it briefly. "The bird was longer, chunkier and lighter colored than the MODO's it was adjacent to. Although I've seen the bird 1000+ times, mostly in Florida, it caught me off guard and off course my camera was in my car. "Checking NJ records, this could be a first Bergen County sighting and the first in NJ north of Sandy Hook." More on this bird here. 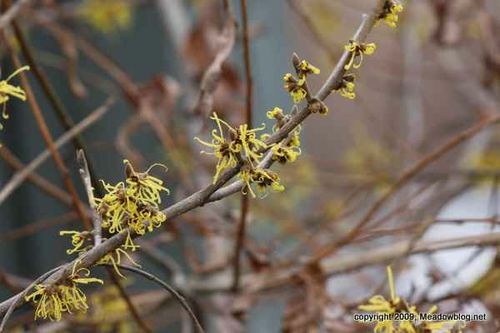 The witch hazel in DeKorte Park is starting to bloom. Falconer Erik Swanson of Lodi and two colleagues brought their raptors to the Meadowlands Environment Center earlier this week for a talk and flight demonstration for Melissa Manzella and her AP Biology Class of Lyndhurst High School. Some of the raptors on display were like no other you have ever seen — including a Gyrlin. The name pretty much tells the story: It's a Gyrfalcon the size of a Merlin. Click here for photos of the Gyrlin and other raptors.